Create a custom, hand painted ceramic tile bathroom using Besheer Art Tile and readily available background tiles from Daltile, American Olean, or plain tiles from most any tile store or home improvement center. Bathroom wall tile accents shown here illustrate how easy it is. ANOTHER VIEW OF THIS SHOWER TILE INSTALLATION USING EGYPTIAN TILE DESIGNS AND VARIOUS SIZES OF BACKGROUND TILES. 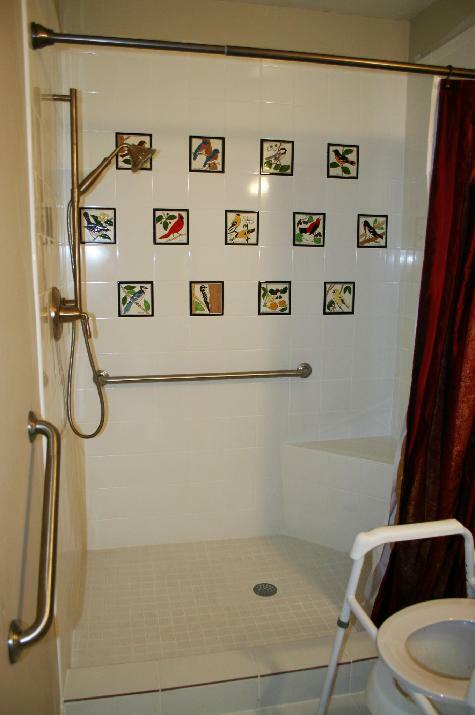 SONG BIRD TILES BY BESHEER ART TILE INSTALLED IN A BATHROOM SHOWER WALL. WHITE FIELD TILES ARE MADE BY DALTILE.